Head to the opportunity detail view to start booking out your kit. You can use a barcode scanner or tickboxes in the web interface. Not sure what’s meant by allocate, prep, or book out? Check out our quick introduction, see: What is the detail view? Use the Allocate, Prepare, and Book out tabs at the top of the detail view to allocate, prep, and book out using a barcode scanner. Make sure that your cursor is in the asset field and start scanning. Current will allocate, prep, or book out the serialized asset or barcoded product that you scan. If you don’t have a barcode scanner, you can type into the allocate, prepare, and book out fields. Current will suggest asset and barcode numbers as you type. You may find it easier to use auto-allocate, described below. Current will make a noise to let you know that an allocation has been accepted and you’ll see a green message letting you know the allocation is successful. Lines turn yellow when you’ve updated them. If you’re working with bulk or non-stock items, specifying a quantity on the allocate tab will allocate the quantity of the barcode scanned. Sometimes you might like to allocate and mark as prepped with one scan. To do this, toggle the “Mark as prepared” toggle to YES and scan your assets as normal. Items scanned will be marked as prepared. To scan into a particular group, lock the group using the green icon to the right of it. Any scan operations only apply to items within that group. See: What is the detail view? A barcode scanner can speed up warehouse operations, but you don’t need one to use Current RMS. Use the tickboxes and the Action menu in the Functions tab to auto-allocate, prepare, and book out your assets. Tick a box next to a group to select all items within that group. 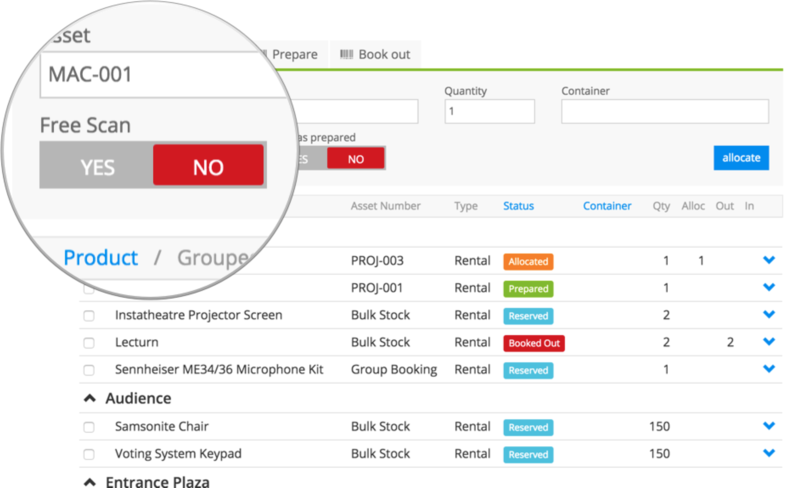 Tick a box next to a product to select it and any accessories or serialized components. Tick the box at the top of the detail view to select all assets. When you auto-allocate, Current automatically chooses the first available asset for you so you can go find those in your warehouse. 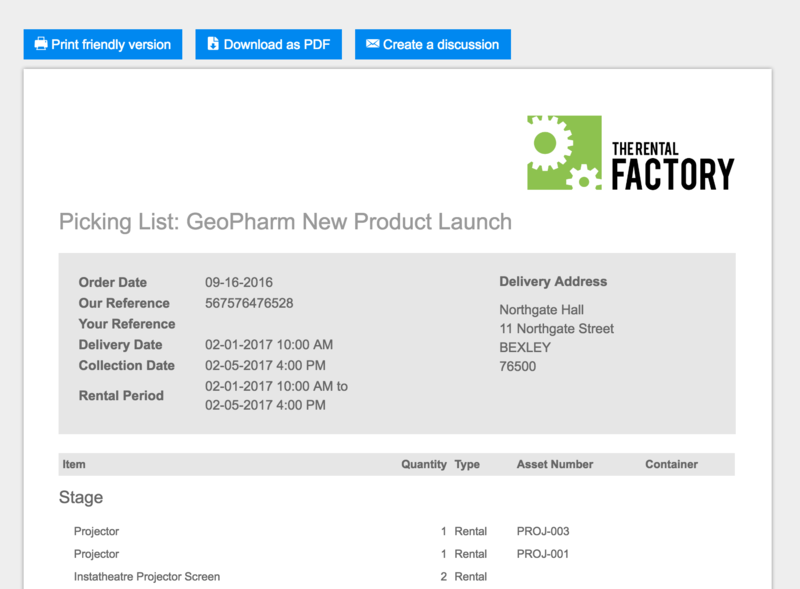 You can have the detail view open on an iPad or tablet and mark each item as prepped as you grab them, or you can print the Picking List document available under the “Print” heading. To auto-allocate, tick the boxes of the items or group that you’d like to auto-allocate and choose Auto-allocate from the Action menu on the Functions tab. To prepare and book out, the process is very similar. Tick the boxes of the items you’d like to prepare or book out and choose the option from the Action menu. If you’ve allocated, prepped, or booked out something in error, revert to the previous status by using the Revert Status option in the Action menu. A container is a simple text field for grouping assets in the detail view – great for things like cases or boxes. You can enter a container on the Allocate, Prepare, and Book out tabs. 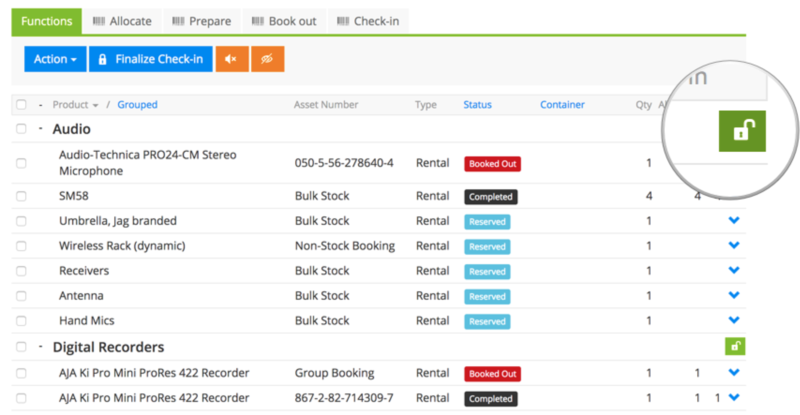 Each asset you scan will be allocated, prepped, or booked out in that container. If you’re not using a barcode scanner, tick boxes and choose Set container in the Action menu on the Functions tab. Sub-rentals are products that are being supplied to you by a third party. If you’ve specified that an item is a sub-rental, use the Set sub-rent supplier option in the Action menu to specify a supplier. To add or modify allocations, edit an opportunity item and check the “Stock allocations” section. What barcode scanner do I need? Current will work with any USB, WiFi, or Bluetooth barcode scanner that operates as a “keyboard wedge” and is compatible with your device. Check out our guide for more: How do barcodes work in Current RMS?